Maybe they will start fracing the wells they have already drilled here as the Company had people in here last week Logging two of the wells and putting Frac heads on them. Guess they will let us know when it comes about. We have found out that in the Gate Guard world they sorta treat you like Mushrooms. (keep you in the dark and feed you s*&^). 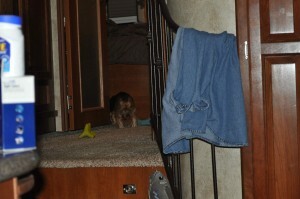 Our Yorkie has decided that we have mice we haven’t seen one yet but for two nights he has been smelling and searching. This entry was posted in Uncategorized and tagged Our Yorkie and Mice. Bookmark the permalink. Gizmo is so cute! Mice – not so much. Our final tally was 13! You’re right! We are a lot like mushrooms! 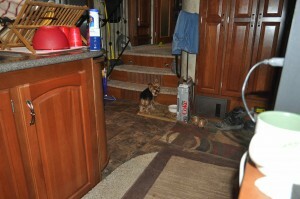 Yeah Debbie that Gizmo was my truck dog when I was driving big rigs and needless to say he is spoiled rotten. We haven’t seen any mice yet I guess they must have gotten into the rat food or the Sonic blasters sent them away. I hope that they will stay gone. Well you all try to stay warm it has been quite cold here as of late. 24 degrees last night. Hey, I love your new banner!